Over three-quarters of the world's population live in cities where the need for affordable urban housing of good design is vital to the quality of urban living. Zhou and Colquhoun look at a wide variety of solutions to this urban design problem showing that understanding of the important design principles is a basic requirement of sustainable housing in the future. 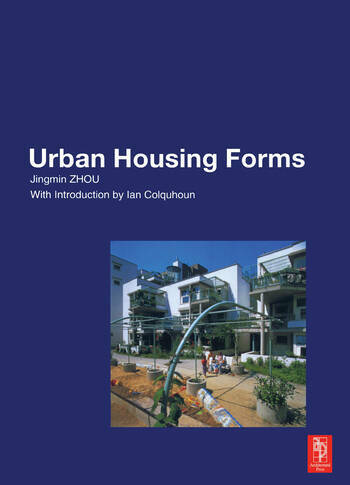 The authors discuss the whole range of different housing types, from an international perspective, approaching both 'concave' housing, such courtyard design, and 'convex' housing including tower blocks. They discuss the famous argument at the beginning of the 20th century between P. Berlage and Le Corbusier that focused on open environment and closed environment. Zhou classifies living environment into two types, "concave" and "convex". In concave housing layouts, dwellings are grouped around closed, secure environments such as courtyards. This form of layout is most successful with inward looking living space. Convex forms of housing look out to an open environment, as do tower blocks. Reason for the book and Acknowledgment; Introduction by Ian Colquhoun; Chapter 1, Density: Under 30 Dwellings Per Acre; Chapter 2, Density: 30-49 Dwellings Per Acre; Chapter 3, Density: 50-69 Dwellings Per Acre; Chapter 4, Density: 70-89 Dwellings Per Acre; Chapter 5, Density: Over 90 Dwellings Per Acre. Case Studies: Atelier 5, Siedlung Ried 2, Switzerland, 1991; Christian de Portzamparc, Housing on Parc de Bercy, France, 1994; Cartwright Pickard, Murray Grove, UK, 1999; Davids Killory, Daybreak Grove, USA, 1993; Herman Hertzberger, Housing in Duren, Germany, 1997; Kunihiko Hayakawa Architect & Associates, Yoga A-Flat, Japan, 1993; Moore Ruble Yudell Architects & Planners, Bo-01 The City of Tomorrow, Sweden, 2001; Merih Karaaslan, Suruculer Terrace Housing, Turkey, 1995; Raj Rewal, Housing for the British High Commission, India, 1997; Mario Schjetnan, Claustro de las Fuentes Housing, Mexico, 1984; Szyszkowitz & Kowalsky, Schiessstatte Housing Complex, Austria, 1999; Frits van Dongen, The Whale, The Netherlands, 2000; Tegnestuen Vandkunsten, Housing Garvergarden, Denmark, 1989; Liangyong Wu, Ju-er Hutong Housing, China, 1992, Renzo Piano, Rue de Meaux Housing, France, 1991, Steven Holl, Makuhari Bay Town Patios 11, Japan, 1996. Index; Bibliography; Photograph Credits.